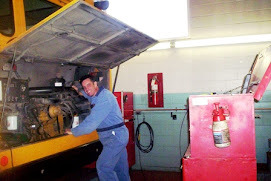 Here's a video I put together going through the steps to rebuilding and installing a Cat 3116 Diesel engine in a pusher school bus. It's a big job and you can see it happen in a matter of minutes. It's much easier to assemble the transmission to the engine and use the trans jack for support and hydraulic hoist on the front end. The whole works rolls right into the frame. Thankfully Thomas Bus allows the rear end frame to be removed. The Cat 3116 is a fussy engine to set up and you MUST have the Cat tool kit. There is no way to set up the timing, synchronization & fuel setting without the kit. Great blog. glad to see your back posting again. cant wait for the next one!